Rutgers School of Business (RSBC) in Camden, NJ, which is part of the greater Rutgers state university system, was founded in 1988. The Business & Science Building was constructed to house the school one year later. In 1995, RSBC became the first business school in southern New Jersey to be accredited by the Association to Advance Collegiate Schools in Business International. Beyond a traditional MBA program, RSCB also offers a 21-month Professional MBA for more experienced professionals who want to accelerate their graduate business studies. The school began its online MBA program in 2015. 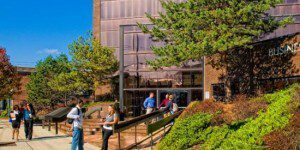 Classes for the full-and part-time MBA programs meet on RSBC’s main campus in Camden. The Rutgers School of Business campus is located just outside of Philadelphia and less than 20 minutes away from the Philadelphia International Airport. The Business & Science Building, which houses the MBA program, is located near the Camden waterfront. In the fall of 2012, Rutgers Camden opened a new on-campus housing facility, 330 Cooper, that is open to graduate students only. The building offers 1, 2, 3 and 4-bedroom options with a variety of amenities, ranging from stainless steel appliances to small group study spaces. In 2014, the school opened The Ragone Center, a facility aiming to bridge local businesses and harbor a professional work environment with students. The business school at Rutgers Camden employs nearly 80 full-time and part-time faculty members. Of the 37 full-time faculty members on staff, 95 percent have reached the highest degree level in their fields. In addition, RSBC employs 30 staff members and administrators. The program boasts a student-to-faculty ratio of 18:1. There are currently 212 students enrolled in the Rutgers School of Business Camden MBA programs. The Rutgers Camden MBA degree can be completed in a full-time, part-time, or accelerated formats. In addition, Rutgers Camden offers an Online MBA option.